Bridge of the UNS Okinawa. The trip in hyper space was much briefer than expected, perhaps some ninety minutes in total. In that time ship's routine was maintained with every department and every single member of the crew on high alert not knowing what they would find at the end of this phase in their journey. When the ship exited the hyper window, they found to their surprise one ship still in the last location detected from Atlantis. It was one of their Generational ships, roughly around the same size as the Okinawa. Mesa was grateful to be out of hyperspace without any issues. She sat back in her chair with a yawn. The Okinawa was certainly different then her last assignment and at that point in time she hadn't been the XO. There were still times she wasn't sure how she had managed to get prompted to that position. And dang it anyhow if she didn't miss having Ty around. She wondered how her best friend was doing. Before she got lost in thought though she shook her head. She looked out the window, a slight smile touching her lips as she studied the ship now in orbit with them. That was very interesting. "Everyone survive the jump?" she asked, looking around at the ones who were still on the bridge. No slouch, Tucker was one of those men who always walked at the double march 99% of the time. He was soon quite ahead of the Skipper along the passageway to the bridge (not that it was very far), skidding to a halt when his eyes fell on the vision sitting there in front of their ship. It was another vessel, very human like in construction and he could only describe it as someone else's version of a 340 cruiser with a few enhancements. "I guess that's who we're looking for. Have they hailed us yet?" He asked the bridge crew in general. The bridge of the Machaera was busier than usual, as circumstances were with the small fleet either tracking or doing their best to avoid direct confrontation with the Vanir forces until they could gather their own vastly spread out fleet it had become a game of hide and seek up until now. Larrin had assigned herself the lesser duty of commanding this smaller and newer ship for its speed and ability to get from A to B without having to be concerned about tail enders keeping up with her. Just prior to the Okinawa arriving in her patrol area, the other ships that had been in company with the Machaera had now gone onto other sectors to complete the tasks set for them. In total the Travelers could amass some 27 ships, 4 of those Ancient Aurora class ships. Standing at the main bridge window Larrin stood there with her hands behind her back, not even bothering to wonder who owned the ship facing them; she didn't have to even if the design was unfamilar, it had all the hallmarks of the human ships from Atlantis and she knew not even the Wraith were so bold as to come directly to the Travelers. At the same time she was in no mood for simple cordialities either. Her voice gave that much away when chose to hail them herself. "Atlantis ship. State your business and be quick about it, this is Commander Larrin of the Machaera." 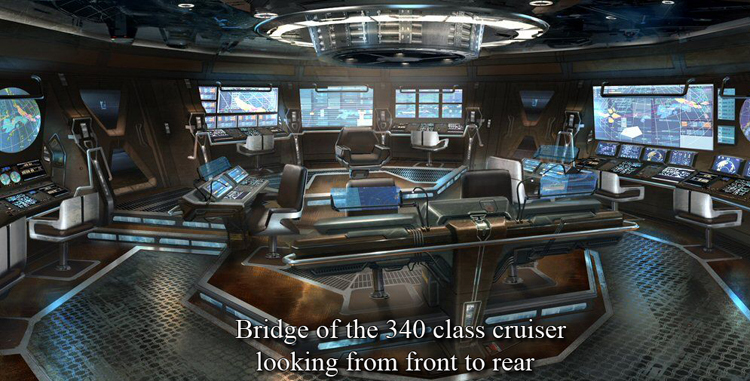 By this point Blackwood had arrived back on the bridge and heard the incoming message. She got on the radio: "This is the Earth ship UNS Okinawa, we need you and your ships." Blackwood was not a diplomatic person, never was. " We are going after the Vanir, you have ships we can use and have helped us in the past. I´m no Shepard, but i am here." The gall of the woman! 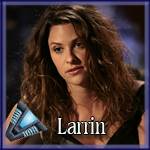 Larrin wasn't someone's intergalactic welfare center as in 'call me anytime, I'm here to help'. Yes they had fought as one against the Asurans and yes she had formed a loose bond with Sheppard in some ways; but even if she knew the stakes she wasn't going to just fall over as easily as that. For even right now many of her fellow Traveler commanders were talking of leaving the galaxy to seek out more peaceful realms elsewhere. "On screen!" She shouted at one of her technicians so that Ingrid could see the anger in her face. "You do do you? And with whom am I speaking? One of Sheppard's women sent to beg for our aid when we can well walk away from this?" She wasn't finished, not by a long shot. "We suffered badly helping you people before, why should we just jump into bed with you again huh? You know I think it'd be more to our benefit to let these Vanir take you and your city, because as far as I can see it this Galaxy saw more peace, yes even with the Wraith around, before you set foot in this region of space. So tell me, humor me, why should we give more of our lives than we've already sacrificed?" With that little speech murmurs circulated throughout the Machaera, heads nodding in full agreement. Soon as they exited Hyperspace, Ben breathed a sigh. Rubbing his forehead, he attempted to fight against this nagging headache that suddenly surfaced. Looking around the bridge, he answer Mesa's question, "Somewhat alive, Major. But, yeah." Looking to his right, the Navigator kept quiet watching the bridge fill up with several more people. Looking at the viewscreen, he noted a Traveler's ship bearing down on the Okinawa It seemed big from a distance. Although he wouldn't want this ship to get stuck in a fight against them, he'd be glad they would be on the right side. At least. As the screen opened communication between Larrin and Ingrid, Ben mused back in his reports from Sheppard. It was an interesting read at least reading from the reports. Listening to the conversation, he had to whistle silently and quietly. Smooth, Captain. Smooth... Watching the conversation between them, Ben shifted his foot only slightly. It had fallen asleep from standing too long. The Navigator hoped to have some Traveler ship on their side and that meant appeasing to their allies. Ben had hoped their CO would be a little more nicer in her tone, or at least bring some chocolates for Larrin as a way of getting her to come along. Or whatever food she likes. Sheppard wasn't clear in their report. Juliette frowned at the arrogance in the woman's tone and muttered something rude to herself in her native Breton dialect that she was sure that no one else on the ship would understand. She turned in her chair. "Skipper, what do we know about these people, other than they hate the Vanir? I'm afraid they didn;t tell us much about them before I joined the ship." Larrin sounded like she needed to be shot, but that was just Blackwoods opinion. She replied to Larrin: "Vanir are viping out human worlds, similar to what the replicators were doing last time. That hurts your supply lines, it is your own interest to help." "Charming. What was it the Joker said? An unstoppable force against an unmovable wall?" He muttered, before deciding he'd say something. Someone here had to have some experience dealing with people, and it wasn't proving to be the Captain here. Dave, however, had experience in defusing tense situations. His background might have hidden that, but it also made sense, as an SF, an SG Team Commander, and a Special Tactics Officer. "Hey, uh, let's all take a step back and slow down, yeah? Look, we didn't mean it quite like that, you're obviously valued allies who we've depended on in the past. We're not in the buisness in making demands of people we like, so how's about we slow down, maybe see if there's something we can do to help you with something. This is everyone's fight, yeah, but we're all friends and neighbors here, right?" Dave said, trying to defuse the situation. "Now, let's start there. I'm Lieutenant Colonel Dave Dixon, US Air Force, and I'd like to know how we can help you and what we can do to earn your support in this conflict with the Vanir." Now that she could see them clearly, Larrin began analysing each face she saw, weighing up their mettle so to speak as if she were inspecting troops about to go into battle. She liked what she saw yet she wasn't about to show it either. "Do you think that is something we're not aware of? It's time Atlantis got out of its cocoon and saw the reality of what life is like in this Galaxy left to its own devices; there is no control, no diplomacy between what should be allied forces, hell we haven't even discussed ambassadorial exchanges since we first met and I still don't even know who I am talking to...." A man interceded at that point, turning the conversation around to where it should have been in the first place. Her eyes narrowed as she focused on the introduction. "...thank you Colonel Dixon. Now we can discuss at length. You know you people really need to learn some manners you know that?" She sucked in her breath looking back to Ingrid. "I assume you are the Captain of your ship? That being so I will tell you this much, we are in the process of gathering our fleet at this very moment and there is much we can discuss. Before we get to that and I suppose this might be an opening to a renewed relationship. My crew haven't eaten a decent meal in two weeks, if you can set up something for 55 people on short notice you have my attention." Commander Blackwood completely ignoring Juliette looked towards the XO. "XO! Have the mess prepare meals for 55+ to be ready in 5 hours. I assume that is going to work for you." If Larrin dropped the attitude, she would not be that bad even. "Anything else dear?" Listening to the exchange between Larrin and Ingrid was like standing in front of a cannon set to go off any minute and you're in a screaming match with it. Ben sighed. Taking a moment to palm his face, he rubbed his temple to get rid of the nagging migraine that flared. Blinking his eyes hard, he eyed the view screen listening to Larrin's request and Ingrid's response to it. Colonel Dixon was standing there, but apparently it was like he was invisible to Ingrid, but not to Larrin. As an officer and a navigator with a moral compass, Ben believed that they should set a standard or a code of conduct to follow. If they couldn't do that, then what would be the point of a sensible conversation between two people. Ingrid is the bad example as she failed to introduce herself properly, but Dixon followed the code by introducing himself and attempted to diffuse the situation. Ben approved it. However, this situation still seems to be of need of some guidance toward the right direction. Placing his arms behind his back, he inclined his reasoning to acknowledge Juliette being visible on the bridge and whispered as to not draw attention lest he brings in the wrath of his CO, "Lieutenant Jurot," it took awhile for him to remember the crew bios before coming onboard. He was required to remember the names and the faces of crew members before coming on duty, "Don't mind the boss. This is our first venture, so we learn in our processes and go. As for the Vanir, I remember from our indoctination at the Alpha Site they were cousins or something similar to the Asgard. Tech level is on that par. For their curren't status. To me, it looks something akin to they are on a path to Armageddon." He sighed shifting his shoulder. Normally, he wouldn't speak unless spoke to, but this is just a small exchange between junior bridge officers. After all, they were here to make friends, not start a war with an ally. While the Navigator wasn't sure of Ingrid Blackwood's current plan, but he hoped for a peaceful resolution. After all, Larrin was trying. He couldn't blame her for being at the wrong end of the cannon. It needs to be diffused. Somehow. The ship's Buffer ambled over to stand in between Stryker and Jurot, his thumbs hooked on his belt. "Yeah ElTee, the skipper is coming to grips with her new command." He told the French woman. "I wouldn't lose sleep over not being spoken to straight up, not when you consider the pressure placed on us right now. She'll loosen up soon enough." He shifted to get closer to Dixon. "Colonel." He admired the man really, having read some of his SG exploits and knowing what he went through with the SGC's Doctor Fraiser helped him form a decent view of the guy. "As the old saying goes, wiser heads prevail." He moved on passing Ingrid as the conversation continued. "I'll go see the Chef and see what he can muster up Cap'n, I'm sure it won't resemble something that tastes like chicken." Tucker then headed for Mesa's station to quietly speak with her. "Major I can take care of that, I suggest you volunteer yourself to go meet our guest down in the bay...oh and good luck with that lady, she looks like she could chew rocks." He left the bridge walking smartly headed for the lower decks and the ship's cafe. Larrin leaned into the camera on her end, she wanted them to make certain that nothing was going to catch her people unawares. "While I appreciate the sincerity of your people Captain....and you know I still don't know who you are yet, we had best get that courtesy out of the way before we can continue. I'll be on my shuttle in five minutes, I'll come alone and we can formalise the arrangements for sending whatever you can provide in nourishment for my crew." She paused. "I assume its safe for me to land in your hangar bay?"